This thread is a suggestion on how to overcome a slow look mechanic that is sometimes seen in alternate aim modes. The dead zone, acceleration, or even the entire look mechanic may be different between the player look mechanic and the alternate look mechanic such as a vehicle, turret, or killstreak. XIM APEX allows you to have six setting pages per config. By default you are using one or two pages depending on which game you are playing. Before we begin expert mode must be enabled to use these extra pages, this can be done in menu-global settings. 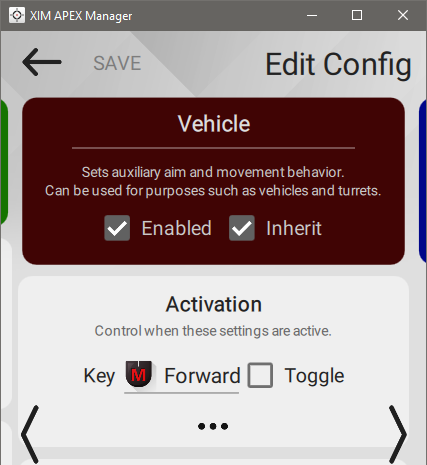 By swiping to the first unused AUX page, giving it a name and clicking 'enabled' you can create a new setting switch that may help in overcoming a slow look mechanic. Activation of this new setting can be set to toggle or hold. Alternatively, XIM APEX allows you to bind the right stick to individual keyboard keys that peg the analog stick when the key is held. 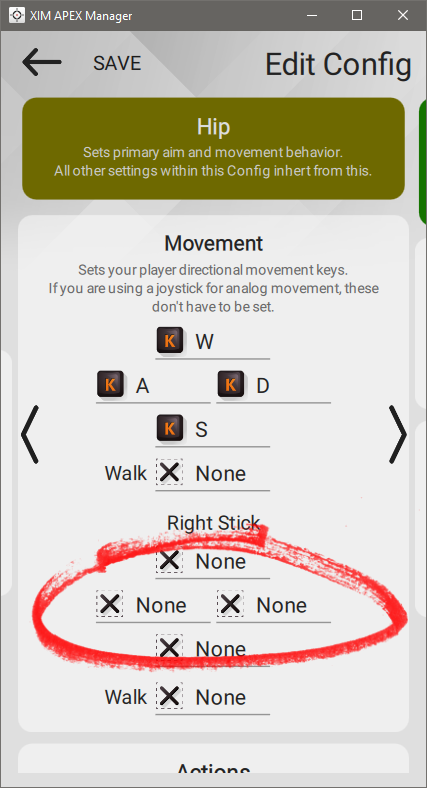 Right Stick mapping can be found by expanding the Keyboard section of your config. There is also a feature named Turn Assist that when either toggled or held will peg the analog stick in the direction movement until deactivated. 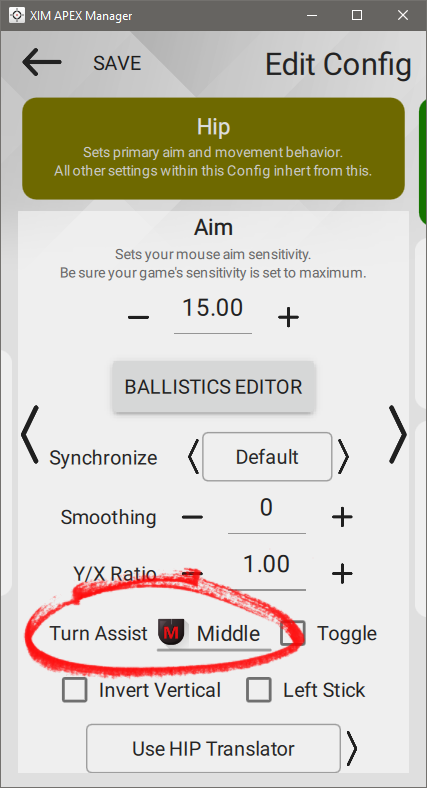 Turn Assist can be found by expanding the Mouse section of your config. Here is an example of using a new setting that uses an acceleration curve to aid in turning. This can be useful with vehicles and turrets. 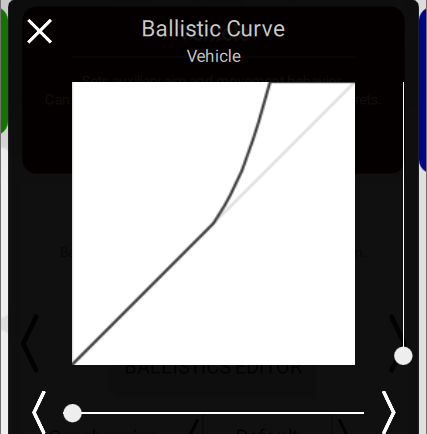 This curve adds acceleration halfway through your swipe allowing you to retain linear movement for the first half of your swipe and have accelerated movement for the rest. Here is a more aggressive curve that uses a lot of acceleration throughout your swipe. To test either one of these curves you must first copy the entire code shown and then in your config select paste from the ballistics window. To revert to default select clear. You may find one of these curves useful or you may find that you needs something in between. I suggest that you experiment with the steepness of the curve to find what works best for you. YX Ratio can be useful to change the speed of either axis. 1.0 is default, going lower than this will decrease the speed of the Y axis, going higher will increase the speed of the Y axis. Improved injury of dead areas in the game and accelerated goals?